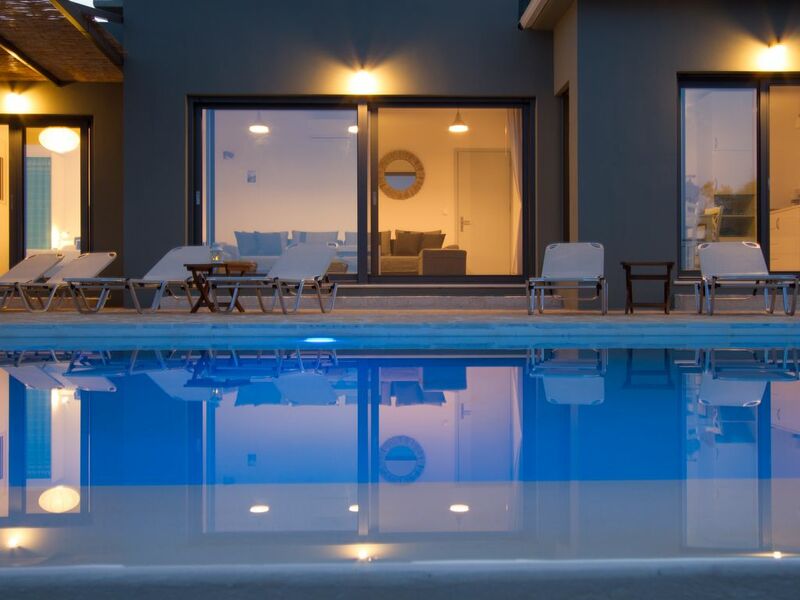 The brand new Villa Atokos open its doors on summer 2016. Perfectly integrated in a predestined landscape, between villas Lefki and Arkoudi, Villa Atokos is a pleasant place to stay and to discover. Two majestic olive trees welcome you at the entrance. You will love the sea sight, studded with Ionian Islands (from Meganissi to Ithaca). From your bed, you’ll be bewitched by the sun rising. This villa is located only at 600m from a pebble beach, accessible through a small steep path. The lovely Sivota harbor with its bars, taverns, shops is at only 20 minutes walking. Chose unforgettable holidays in a haven of peace, under the olive tree or the pergola’s shadow, from where as a focal point, you can see the infinity pool and the sea. We wanted to create an ideal place for you to escape, while keeping your bearings (you are at home!). A beautiful infinity pool 9m x 4m with a unique view over the sea. A big stoned terrace connects to the house, the swimming-pool, the outside shower and the olive tree. The afternoon naps under the pergola, rocked by the cicada’s song, will give you a nice sensation of well-being. You will enjoy delicious barbecue parties near the olive tree. Living-room (satellite TV, internet WiFi connection). Entirely equipped kitchen with dining room. Two bedrooms with bathroom for each (one with tub, the other with shower). Each of it has an access to the terrace. One room with 3 single beds 90 x 200 with bathroom (shower). Common toilets with living-room and bedroom. One laundry room (wash machine, iron and ironing board). Villa Atokos is located at 2,5 km from the village of Sivota (Lefkada), with a wonderful view on the Ionian sea and its Islands. Please note that the last kilometer to arrive at the villa is a non asphalted road. We enjoyed our time spent here and are glad we were close to Syvota, rather than a larger town. The trip up the mountain is a bit bumpy but it is worth the drive. You will need a car if you rent this home. The island is fun to explore and more things are a bit of a drive from the villa. Views from this home are spectacular and the pool makes looking out over the sea even more beautiful. The landscaping around the property is stunning. We admired the wide range of spectacular flowers and trees. I enjoyed taking lots of photographs of colorful blooms. We were greeted by a friendly host who even made the trip from Lefkata to make sure we were happy with our stay as we departed. The home has contemporary and tasteful decor, without clutter. The home contained everything we needed for our comfortable stay and our host even had cold water waiting for us upon arrival. The beds are comfortable and extra blankets are provided if you should need them. The towels are soft and the home was extremely clean. The washing machine is small but it suited our needs very well. The Internet is a little slow but that was fine for us as we just needed to check in our our email once or twice a day. If you plan to do a lot of work online, you may need to go to the village where many cafes offer free connections. One suggestion I have is to incorporate some lamps into the living space so that lighting can be adjusted to a softer mood. The bright overhead lights are a bit too much for evening. We loved this home and left with many fond memories that will last a lifetime. Our hearts are still in Greece, even weeks after we have returned home thanks to the fond memories we shared here. It was very nice having you here. Thank you very much for your nice words. It makes us very happy to know that we contributed to your memorable holidays. We will be glad to host you again anytime. Your comment about the living room lights is very interesting and helpful. Thank you once again for choosing to stay with us in VillasThalassa. I enjoy my stay in this pretty villa well furnished. I like a lot: the small beach 5 mn by foot,the sunrise and the seaview from the infinity pool. Thanks Anna and Tasos for your help. Everything about the villa was great, new, clean, fully equipped but the most amazing was the view! A lot of privacy but there is a lot of building new houses going on...I hope the villa will still have the privacy it has now. I think the first thing I will remember is the view !!! I could have spend my all time watching it in the pool. In the house there is every thing you need and I found it very clean. The place is so charming and we had a lot of fun visiting the island. Nous nous souviendrons longtemps de notre séjour à la villa Atokos. Encore plus beau en vrai, la villa est très chaleureuse très bien décorée. Super isolation phonique entre les chambres. Le lever du soleil de son lit, c’est magnifique(mais avec rideau électrique commandé du lit qui permet de gérer la luminosité). L’île de Lefkada à découvrir :(elle peut-être découverte par diffèrent moyens de transport) Quad, Mob ou par la mer en excursion. Nous avons adoré le quad, découverte d’une belle chapelle qui domine toute l’île. Nous vous recommandons ce lieu magnifique.